Nit de les Carinyenes (“The night of the Carignans”) just saw its 9th edition last week. 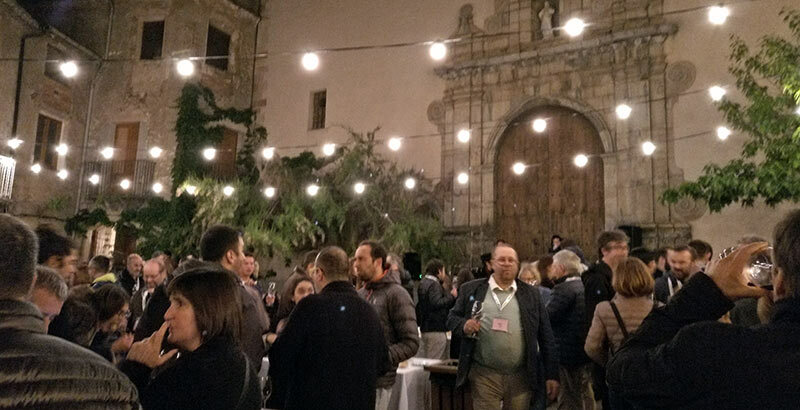 For those who sadly may yet be unaware of this event, it’s put on yearly by the Porrera Cellars Association and showcases the grape which the village is best known for in DOQ Priorat: Carignan. The 17 cellars in attendance are usually pouring 100% Carignan wines which can take the form of finished wines or then a barrel sample that’s the Carignan for part of a blend. Despite its happening in the spring and having a tasting of yet-unfinished wines, it’s not really some version of an “en primeur” but more an exploration of the awesomeness of Carignan. For the first seven editions, the venue had bounced around one of the restaurants in the village. This was generally less than optimal as some spaces weren’t really fit to host 150+ people standing around sipping various wines from all the producers. This in addition to the different location each year that people had to search out (Porrera ain’t big but the streets are twisty) had room for improvement although it was hard to complain as the wines made up for any lacking detail such as this. Thus last year for the 8th edition, those in charge of running it, namely Albert Costa of Vall Llach, decided to put it on fully-neutral ground and hold it in the main church square of the village. It was a fantastic success as it opened up more space for people to taste and there wasn’t the packed crowding you’d find in years past. This was quite crucial as let’s face it, people attend the event as the wines are delicious and so everyone gets a bit “swervey” by the end of the night. A little bit of wobble space is a good thing, especially once the dancing starts. And just to prove that last year wasn’t a fluke, they held it in the church square again and it was fantastic for the same reasons. I had just come off a week judging for the Decanter Awards and unfortunately my mouth was in truly no shape to taste, but it was great to see everyone again and if they manage to continue having it in the square (I’m sure the few neighbors there can’t be thrilled) it will continue to grow as it now has the space as well as the reputation of being one of the must-attend events of the annual Fira del Vi. El lloc ha millorat finalment i no sentir-se massa apretat és bàsic.